Welcome to the Mattawa area. Thanks for visiting, even if it is from a computer screen. We are in dry, desert, eastern Washington. The only mountains, actually hills, around us are the Saddle Mountains. They are covered with sagebrush and rock. Reportedly the tallest, treeless mountain in the world is just out our backdoor, Rattlesnake Mountain at 3,560 feet. The mighty Columbia River cuts the Saddle Mountain range in half near Beverly and Schawana and its beautiful. We have hunting, fishing, and water sports on the river. The retirement community of Desert Aire is just five miles from Mattawa. Its a beautiful setting along the Columbia with a great 18-hole golf course. We boast some of the sunniest weather in the state. What keeps most people in work here is agriculture. We grow some of the worlds greatest apples, have our own official wine grape appellation: Wahluke Slope Appellation, and grow lots of other crops including alfalfa, cherries, potatoes, onions, peas, corn, asparagus, plums, apricots, peaches, pears, and many seed crops. We have a wonderful, modern school campus. Students from kindergarten to 12th grade attend here. We have about 1,950 students. We are made up of many migrant students, mostly from Mexico. This is because of all the agriculture. The city started as a construction town, in the 1950s with the building of the two dams. It sort of sprang up overnight, platted primarily by Morris and Ellen Schott. They, both now deceased, are our founding family. Our population is about 5,000 now, but that changes with the seasons and the work. We have grocery stores, a post office, gas stations, restaurants, a hardware store, a newspaper, many other businesses and a straw bale library, at this time the only straw bale library in America. It is made with straw bales covered in stucco. We are thrilled to have our own library, finally. We also have two hydroelectric dams within 10 miles. 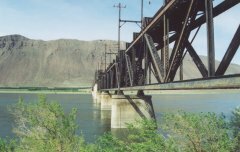 They are Priest Rapids and Wanapum dams. The Wanapums are the Native Americans who originally, and still do, live here. Our electricity is some of the cheapest in the nation, but wed like to keep that a secret. We are very fortunate to have one of the greatest volunteer fire and medical aid departments you could have. Chief Dave Patterson, the fire commissioners and the crew has brought the department into the 21st Century with modern equipment and well-trained volunteers. Thanks for visiting. If you can, drop by in real life some time.